Interval training has to be one of my favorite ways to workout. It keeps me from getting bored, and I tend to feel like I work harder. 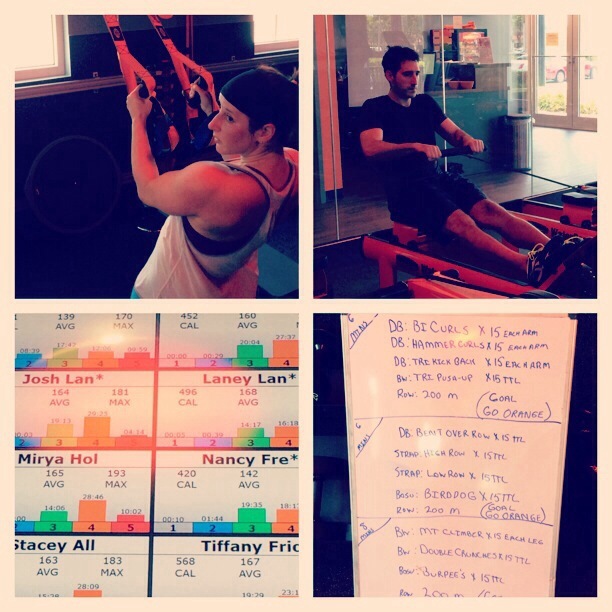 It was the combination of treadmills, rowers and weights that drew us to Orange Theory Fitness. Mention it to a group of friends and you almost always hear "Oh, I've wanted to try that" or "I love it." Josh and I finally made good on our "we want to try that" comment yesterday by taking Jonathan's class at the Delray location. We got their early as instructed for our free trial class. Right off the bat, I love the vibe and energy. After being fitted for our heart rate monitors, we are introduced to Jonathan who takes us through the basics of the workout. Here is the jist: OTF uses heart rate monitors to ensure you are getting the most of your workout, which consists of blocks of treadmills, rowers and weight lifting. You are split into two groups (basically you get there early to claim a treadmill and then you get to start on the treadmill). Workouts come from Corporate, and are mapped out for the month. Though some people may choose to change them a bit. Today's workout was about strength and arms. We started in the weight lifting group which had three blocks and were encouraged to use heavy weights. You go for as many times as you can in the allotted block timeframe. We used dumbbells, trx-like straps, bosu balls and body weight. The treadmill block involved hills and sprints, and was the type of workout I hate because I hate hills. Despite being in a class of 25 or so, Jonathan had his eyes on EVERYONE. He saw Josh start to fade from across the room and gave him a little shout out. He saw me have to stop and stretch my calves since they were cramping up, and gave me a concerned look basically asking if I was ok, all while barking orders to the rest of the group. His taste in music was baller too. It was probably one of my favorite workouts I've done in a long time. Probably since I went virtual with Leslie Ann. Chances are high that Josh and I will be making this a regular stop on our fitness dates.